At the Hauptbahnhof train station, I waited for the train to Prague and bought breakfast, a big plastic cup of yogurt. Kelly asked me if I needed silverware and I said, "No thanks, I have a schpoon." "Did you hear that?" I said, "I just said schpoon! That was Germany GETTING INTO MY BRAIN!" Not that schpoon is a word - it isn't - but I didn't pronounce an "s" like that two weeks ago. Kelly looked at me like it was kind of early in the morning to be using so many exclamation points. We dug into our cups of yogurt and were quiet for a minute until she couldn't take it anymore. "I'm not complaining," she said, "But this isn't like any yogurt I've had before." She scooped out a spoonful and held it upside down. The yogurt didn't move. "That's not yogurt," I said, "That's caulking. That's rough." She asked me how mine was. It was pink and runny and was mixed with what I thought were leaves until I diagnosed them as chocolate shavings. She suggested combining our yogurts and plopped a chunk of caulking, the weight of which almost sprained my wrist, into my cup. A spoonful of yogurt should not weigh twelve pounds. "Good lord," I said, "Don't eat that stuff. It could caulk your throat up and kill you." A few hours later, the train crossed the border into the Czech Republic and Kelly suggested we learn some Czech words. She pulled out her book, started reading aloud, and I knew I was in trouble. I've been hollering a lot about German but once you get a few pronunciation tips, what you see is largely what you get. Yes, the words are as LONG AS HELL but if you can manage to not fall asleep in the middle of them, there is something familiar about them. 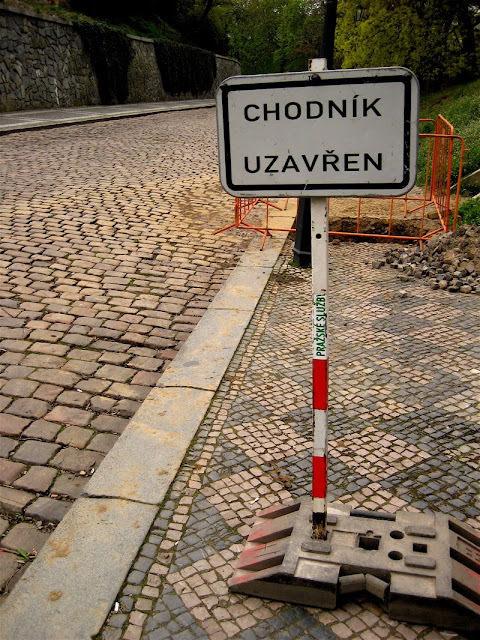 Czech, though? Ouch. Maybe if I'd taken more than five minutes to prepare for the trip, I'd feel differently. As it is, street signs like this elicited long sighs. Sometimes context clues tipped me off and I'd be fairly certain that the sign in front of the big hole on the sidewalk said something about not falling into the big hole on the sidewalk. 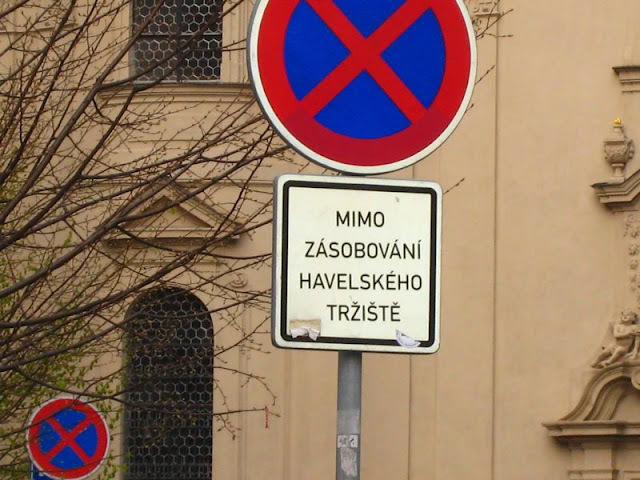 Usually, though, the Czech language just slapped me around and I'd eventually give up, defeated. This is me looking at a map in Prague. It appears that I'm gathering information about my whereabouts but I easily could have just been free-associating. How'd the Bengals do last season? Should I try a bacon and cabbage potato pancake? Is grilled pork knee tasty? Because after scouring this map, I looked up, "Well, that didn't help at all." The lack of a You Are Here plus the fact that I can't pronounce anything makes my brain go on strike. The upside of this is that there is something about Czech that is damn cute. Doesn't calling a laptop computer a notebooky make you want to snuggle?